Is flying premium economy worth it? 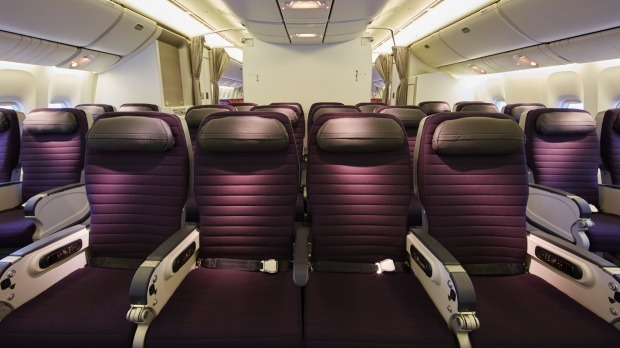 Virgin Australia's premium economy cabin. A typical premium economy seat costs a little over twice the price of a discount economy class seat, however there are sometimes bargains around. What you get for your money is a separate cabin between business and economy and a seat with greater leg room. Most premium economy seats offer a pitch of 96.5 centimetres, about 15.2cm more than an economy class seat. The seat is also wider, about 4cm more than in economy, and recline angle is greater. Cabin configuration is generally one less seat a row than in economy aboard the same aircraft. Premium economy flyers also get a different menu from those in economy, although a fair way short of the business class menu, a separate check-in desk but not priority luggage tagging, a bigger entertainment screen, upgraded headphones, increased baggage allowance and priority boarding. There's also a larger tray table that you can actually use as a workstation but sometimes no dedicated toilet in the premium economy cabin. Not all airlines' premium economy classes are equal, some are worth it, others questionable, check reviews on Skytrax.